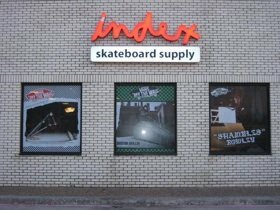 Established in 2004, Index was founded on one premise: skateboarding and skateboarding only. They carry all of the latest products, but their belief is that a true skate shop should be more than just a store. Index was created as a community center for skateboarders; a place to congregate, make friends and learn the culture that is skateboarding. Welcome to the Index family.